I just completed two more sewing projects and realized that they're both black and white, which was totally unintentional. 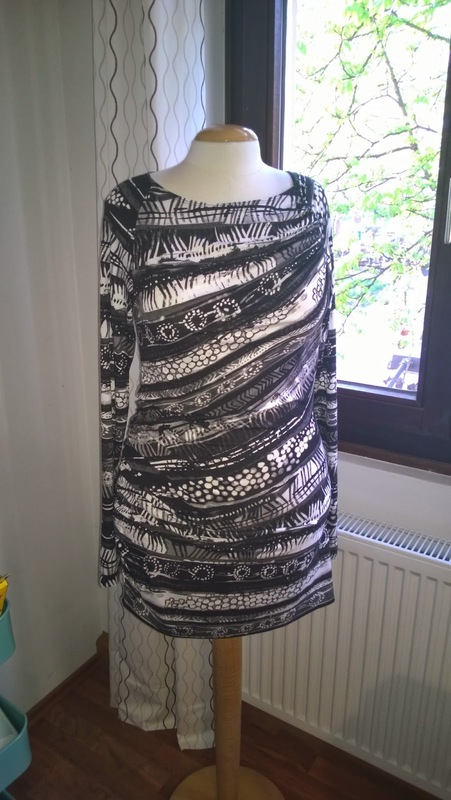 Black and White #1: A top for me from the January 2014 Burda Style magazine. This should have been a quick sew but I got bogged down by the gathered portion across the right hip. The reason? I cut only 1/4" seam allowances, which left me with too little real estate for gathering and fussing. I did a lot of fussing. Actually I did a lot of basting. It wasn't absolutely necessary to do all this basting but that's how I do things. I baste where most people probably just pin. I hate getting stuck by pins - hate, hate, hate it. So anytime I might have a difficult area to sew around I reach for a contrasting thread and a long needle, and I baste. I use contrasting so that I can find it to pick it out. I've recall someone, Kenneth King maybe, telling me in a class to use the same color thread to you don't have to pick it out afterward but I always pick out my basting thread. If there's a situation where I won't have access to it after I sew, then I use matching thread. I always baste set-in sleeves, anytime I need to match something exactly, slippery fabrics, or if the area I'm sewing is difficult to maneuver in the sewing machine. With this Burda top I basted all but the flat side seams. I even basted the hems before coverstitching! I don't often use pins when I'm serging - partly because I'm afraid of running the knife blade over them but also because there's not a lot of room to work around the needle... and I hate getting stuck with pins! Overall Impression I like this top a lot. I think it looks better on me than on my dressform. The top is a little long, but I think it will look nice over slim jeans or pants. Maybe if I were younger I could get away with pairing it with leggings. It wasn't too difficult to sew, although the gathers on the hip took a while. Pattern Description: Jersey shirt with long, raglan sleeves and gathers at the left shoulder and right hip, giving the front a diagonal look. Pattern Sizing: European size 34-44. I made a size 44. Were the instructions easy to follow? Yes, but I think there's an easier way to do the gather on the hip, which I didn't think of until after I'd followed their instructions. The instructions say to gather each piece separately and then join them. Since my fabric has stripes I wanted to make sure they matched so I carefully basted the two pieces together, which was difficult with all the gathers. It occurred to me that you could join the pieces first and then gather them. If you have stripes to match, you could hand baste to make sure they line up and then machine-baste to get two rows of even stitches. I ironed on stay tape to the top sleeve seams, but I used straight, not bias tape. I used Design Plus super fine fusible stay tape, a product I use a lot for the shoulders of knit tops. It actually wasn't a conscious choice to use the straight tape over the bias (I have both) but I think it was actually a better choice than using the bias because I don't want the sleeves seams to stretch. The instructions call for adding a clear elastic tape, over the gathering on the hip. Since I'm living in Germany right now, I was able to get the Framiliastic product named in the instructions. It's a nicely weighted, clear elastic, similar to the clear elastic I've found in the US, but not as tacky to the touch I think (or maybe the clear elastic I've used in the past was old). Something the instructions don't say is to remove your basting thread from the gathering at the hip after you've sewn the seam with the elastic tape. If you don't, the gathers won't be springy and your application of the clear elastic is wasted. What did you particularly like or dislike about the pattern? The neckline came out a little large, but that could be my fault. I didn't use the facing piece and instead turned the neckline edge under and coverstitched. This may have stretched it a bit or I may have turned under too much. Perhaps I should have ironed on some fusible bias tape on the neckline edge first. If you do this, check to make sure it's still large enough and stretchy enough to go over your head! I used a 4-thread overlock on my serger for all seam construction and the serger's coverstitch for the hems. I cut 1/4" seam allowances but this was a mistake in some places! I often use 1/4" seam allowances on knits but here you need a bit more seam allowance to manage the double row of basting for the gathered portions. The instructions call for 5/8" (1.5 cm) seam allowances. Fabric Used: A jersey fabric I purchased here in Stuttgart. I don't remember the fiber content but it looks and feels like cotton/rayon. It was on a 50% off sale in the department store - yes, department stores in Germany (well at least Karstadt) have fabric sections! Pattern alterations or any design changes you made: I didn't make any alterations or design changes but I did leave off the facing on the neckline. The sleeves are really long, which I left as-is. Usually I find I need to shorten Burda sleeves by an inch or two but I left these alone in case the fabric shrinks (I didn't prewash!!!) but also I like the look if I scrunch up the sleeves to 3/4 because it mimics the folds of the front of the top. Would you sew it again? Would you recommend it to others? I would sew it again but not to make another top for myself. I do recommend it! 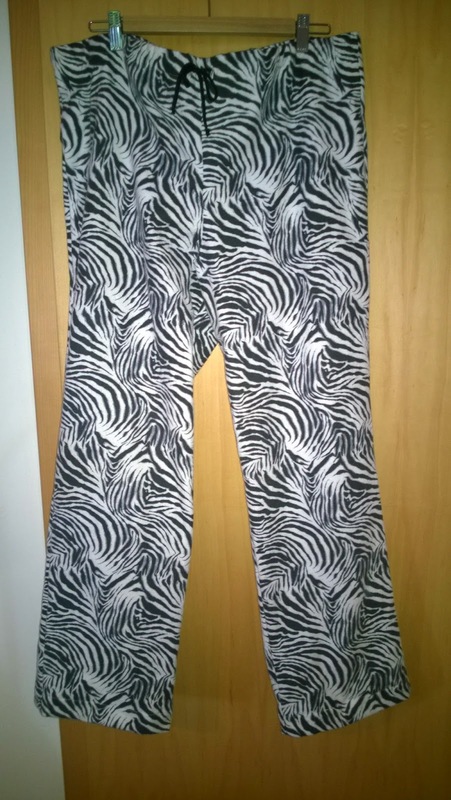 Black and White #2: Sleep pants for my husband from the December 2010 Burda. In the past I've made my husband numerous pairs of flannel sleep pants using Kwik Sew 2687 but since he needs new ones, in a smaller size (thanks to diet and exercise - yay! ), I thought I'd try a Burda pattern. I used a crazy zebra print as a wearable muslin before I cut into some Paul Frank Julius print flannel to make him some "monkey" pants. I liked the results, so the monkey pants are a go. First, I compared the Kwik Sew pants pattern to the Burda pants pattern. The Kwik Sew definitely has more ease and fits like "American" style pants. The Burda is more European in cut, as you might expect. My husband wears a European size 52 so I compared that to the Kwik Sew size Large, which I made for him in the past but are too large now. I compared the widest part of the back and front leg pieces, the rise and the overall length. I found it interesting that most of the extra ease in the Kwik Sew was in the front and also how low the rise is in the Burda pattern. Others who reviewed this Burda pattern also noted the short rise, so I was prepared for that and adjusted it on my pattern. Pattern Description: Pattern for a man's pajama top and bottom. The top is a collared shirt with piping, pocket and 4 buttons. The pants have a fly front and drawstring waste. I only made the pants. Did it look like the photo/drawing on the pattern envelope once you were done sewing with it? Pants are pants. Not too different. Were the instructions easy to follow? I didn't use the instructions, but I glanced at them and they look like the usual way to sew pants. Sewing pants is easy - it's the fit and details that can make it difficult. What did you particularly like or dislike about the pattern? I liked that they were basic, drawstring pants. I didn't like the fly or the unnecessary, additional waistband piece, so I omitted both. Pattern alterations or any design changes you made: I omitted the fly and added 3 inches (approximately 7.5 cm) to the top of the pants. I used 1 1/4 inch wide elastic with an enclosed drawstring, so I made two button holes for the openings for the drawstring. Would you sew it again? Would you recommend it to others? I will be making the pants again for sure. If you want a less-slouchy type of pajama pant, then this Burda pattern is a good choice. 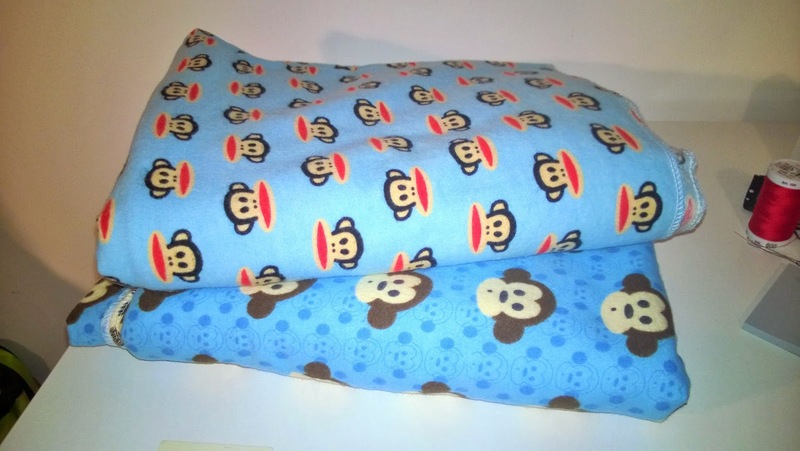 Next on my sewing table: monkeys!! Hi Lori, you have indeed been busy at the sewing machine. Interesting and pretty Burda top. I am looking forward to your upcoming visit......remember BABES is meeting here at my house Apr. 6. I will posting on the Yahoo Group soon to start the conversation about timing et al. The top looks FABulous on you! Love the lines created by the gathering - great fabric choice. :) See you soon! Thanks! Looking forward to next week!